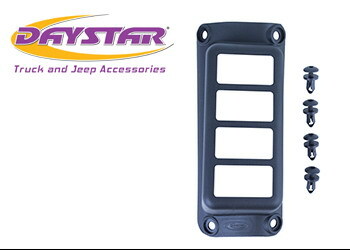 Mount your auxiliary switches up and out of the way with the Daystar A-Pillar switch panel for 07-18 Jeep Wrangler JK Wranglers! The A-Pillar switch panel puts access right at your fingertips all while keeping rocker switches out of the way from the dash and shifter. Pre-molded cut outs are designed to accommodate four Daystar rocker switches (not included).